Readers of Meetings & Conventions magazine have bestowed the prestigious Gold Service Award on Visit Phoenix (formerly the Greater Phoenix Convention & Visitors Bureau) for the 23rd consecutive year. Meetings & Conventions magazine is a leading publication among meeting professionals, and 50,000-plus subscribers each plan a minimum of three off-site meetings, conventions and/or trade shows per year. The Gold Service award honors convention and visitors bureaus (CVBs) that excel in professionalism and dedication in their service to meeting professionals. The magazine’s readers were asked to make the 2013 Gold Service Award selections based on criteria that included professionalism of staff, support on hotels and site inspections, assistance with ground-transportation planning, guidance on local attractions, and liaison with local venders and services. Readers voted for the top CVBs throughout North America, and Visit Phoenix’s convention services team was rated among the best for the 27th time. 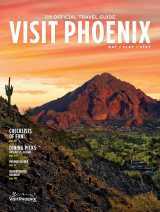 Visit Phoenix will be featured in Meetings & Conventions’ special “Gold Awards” issue in November.